We see nonviolent resistance all over today’s world, from Egypt’s Tahrir Square to New York Occupy. Although we think of the last century as one marked by wars and violent conflict, in fact it was just as much a century of nonviolence as the achievements of Mohandas Gandhi and Martin Luther King, Jr. and peaceful protests like the one that removed Ferdinand Marcos from the Philippines clearly demonstrate. But what is nonviolence? What makes a campaign a nonviolent one, and how does it work? What values does it incorporate? 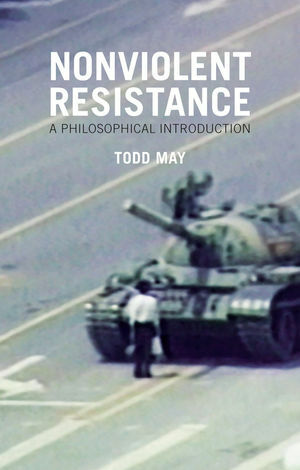 In this unique study, Todd May, a philosopher who has himself participated in campaigns of nonviolent resistance, offers the first extended philosophical reflection on the particular and compelling political phenomenon of nonviolence. Drawing on both historical and contemporary examples, he examines the concept and objectives of nonviolence, and considers the different dynamics of nonviolence, from moral jiu-jitsu to nonviolent coercion. May goes on to explore the values that infuse nonviolent activity, especially the respect for dignity and the presupposition of equality, before taking a close-up look at the role of nonviolence in today’s world. Students of politics, peace studies, and philosophy, political activists, and those interested in the shape of current politics will find this book an invaluable source for understanding one of the most prevalent, but least reflected upon, political approaches of our world. Todd May persuasively advances our understanding of nonviolent resistance through his examination of the values of “dignity” and “equality”. Drawing on numerous examples and lines of thought, he demonstrates that these values almost always underlie nonviolent resistance and contribute to its unique power relative to violence and institutional politics. He adeptly weaves social science and philosophy to leave the reader with a deep understanding of nonviolence. The last 40 years has seen the growth of a large and valuable literature on nonviolence from social scientists, legal scholars, and activists. One group largely absent from this growing conversation have been philosophers. Todd May's magnificent new book remedies this by bringing the very best of contemporary philosophical theory into active conversation with the concerns and perspective of an experienced activist. This is no mere abstract theoretical discussion. Rather, May shows with both erudition and subtlety why the concerns of political philosophy actually matter to the work of nonviolent action for social change. This ground-breaking work is required reading for both scholars and intellectually engaged practitioners.